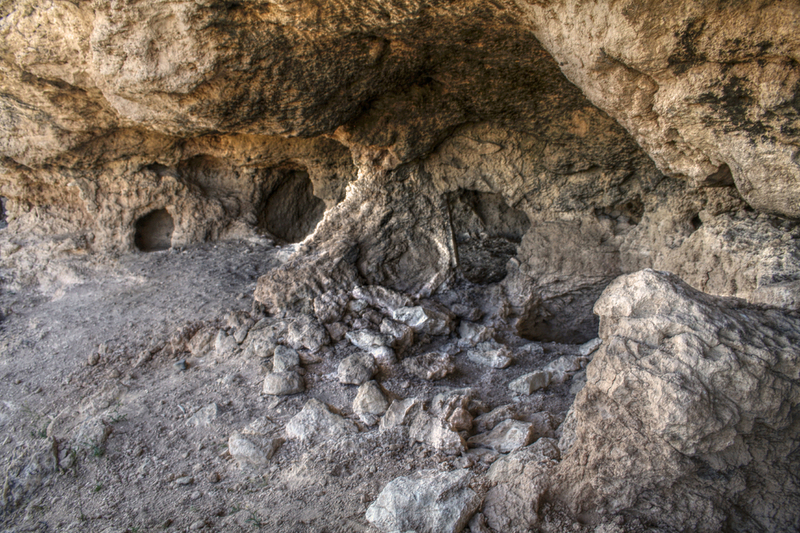 The Verde Valley has been a magnet for civilization throughout the millennia. Reliable water, abundant wildlife, fertile soil, and ready shelter - all the elements to establish a permanent settlement can be found in the "green valley". One of the earliest inhabitants of the Verde Valley was the Hohokam, originally a pithouse dweller and dry farmer, dependent on rain for their crops. The pithouse was constructed with a shallow rectangular, but round-cornered pit which was covered with a superstructure of poles, brush and clay. 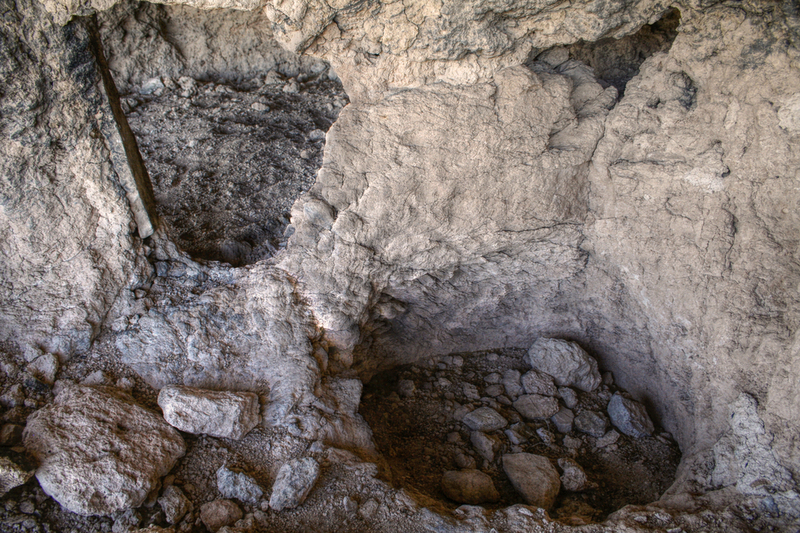 The remains of a pithouse has been excavated at nearby Montezuma Well. In 1066 Sunset Crater erupted, covering 800 square miles with black ash, forcing many of the nearby inhabitants to flee the lower slopes of the San Francisco Mountains. Many Sinagua migrated to the Verde River and seemed to intermingle with the Hohokam people. The cultural blending, and subsequent population boom, prompted three notable advances; the adoption of Hohokam irrigation systems from the south, the building of above ground masonry dwellings characteristic of the Sinagua from the north, and a merging of rock art styles. 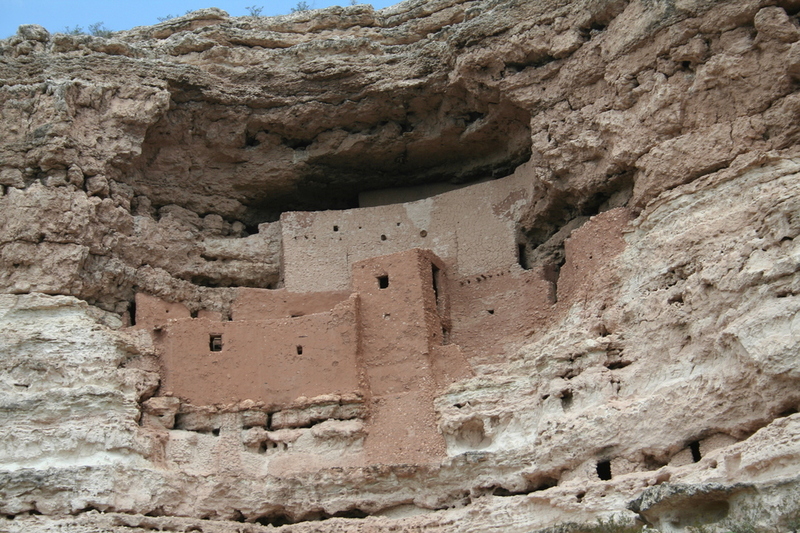 The remains of a masonry cliff dwelling has been preserved at nearby Montezuma Castle. There rock art is exemplified by the nearby V-Bar-V petroglyph sites. 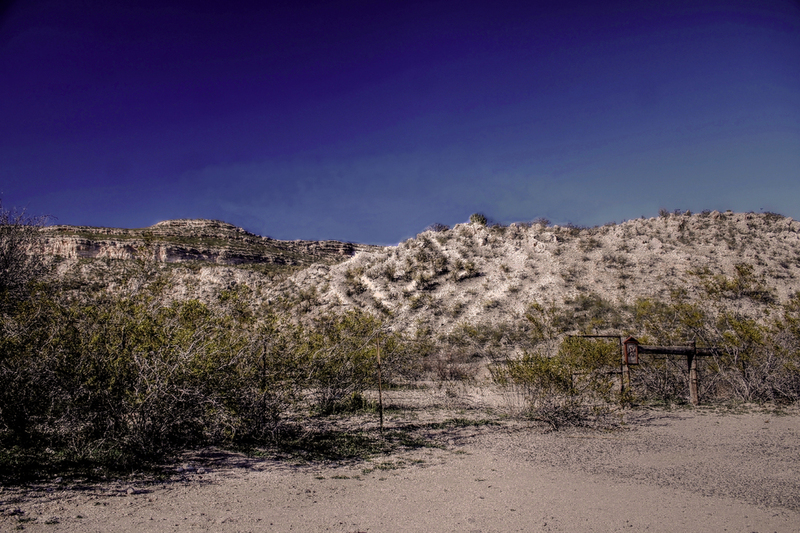 In the early 1400s, the Sinagua abandoned the entire valley. No one can say why, perhaps too much pressure on the land, drought, or conflict with Yavapai, who were living here when the Spanish entered the valley in 1582. Whatever the reason or reasons, the survivors were probably absorbed into pueblos to the north. Some may have moved to the Little Colorado and may be among the ancestors of present Hopi Indians. Cotton weaving found at Tuzigoot has been compared to the Hopi and the similarities suggest a connection between the two cultures. The Yavapai were nomadic, moving from one area to another in small bands and family groups. They followed the various wild foods and the locale of the game they hunted. They made brush shelters called "rancherias," small temporary circular shelters, usually made at each stopping place out of branches, brush and mud. At times some groups took shelter in natural caves. Crops were occasionally planted in moist bottomland to supplement their wild diet, but they did not store food in any large quantity. After planting, the Yavapai continued their migration and returned in fall to harvest their crops. In 1582 Diego Perez de Luxan, a Spanish explorer, recorded the first evidence of a Yavapai settlement. The Indians gave the explorers metals as a sign of peace and led them to their mines. The explorers considered the mines poor, as it was of copper and not silver or gold, so returned to their base camp. Other explorers came to the Verde Valley from time to time, searching for gold and silver, but contact with the Spanish or Anglo-Americans prior to 1860 was infrequent. Miners, ranchers, and other settlers entered the Verde Valley shortly after 1860. Predictably, extreme hostilities broke out and continued until the Yavapai were completely defeated by General Crook in late 1872. Most of the Yavapai were placed on the Camp Verde Reservation where they remained until 1875. In 1875 the Yavapai were removed to the San Carlos Reservation. 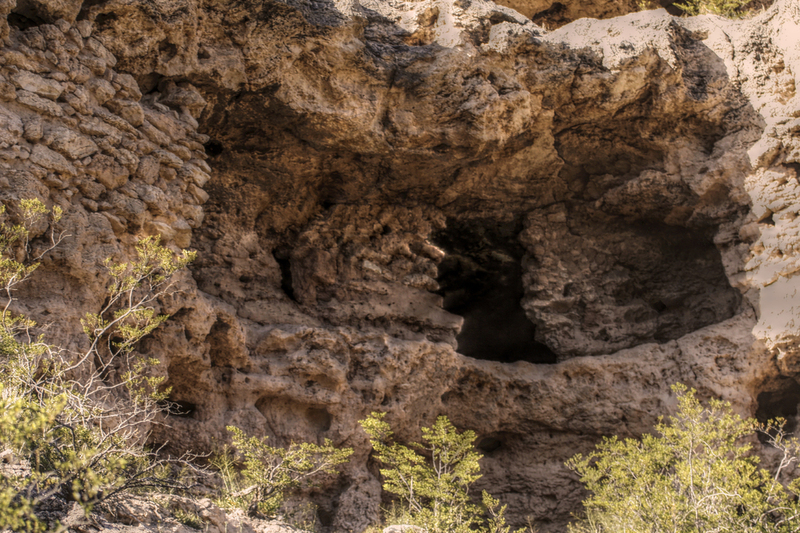 • Tuesdays from 10 a.m. to 3 p.m.
• Saturdays from 11 a.m. to 2 p.m.
"Hundreds of years ago, the Sinagua Indians lived in the central Arizona area. Evidence of their dwellings and tools from their daily life may still be found in the West Clear Creek drainage. If you encounter a ruin or artifact, please DO NOT disturb the area. This allows others to also feel and enjoy the sense of ancient history that can be imparted. If you examine a particular artifact, replace it where you found it. A lot of its value is derived from its specific location, in relation to other objects and the surrounding environment." Examination of our topographic map confirmed that the Camp Verde Cliff Dwellings are within the Coconino National Forest in an area noted as "The Caves" within the "Old Military Reservation Boundary". 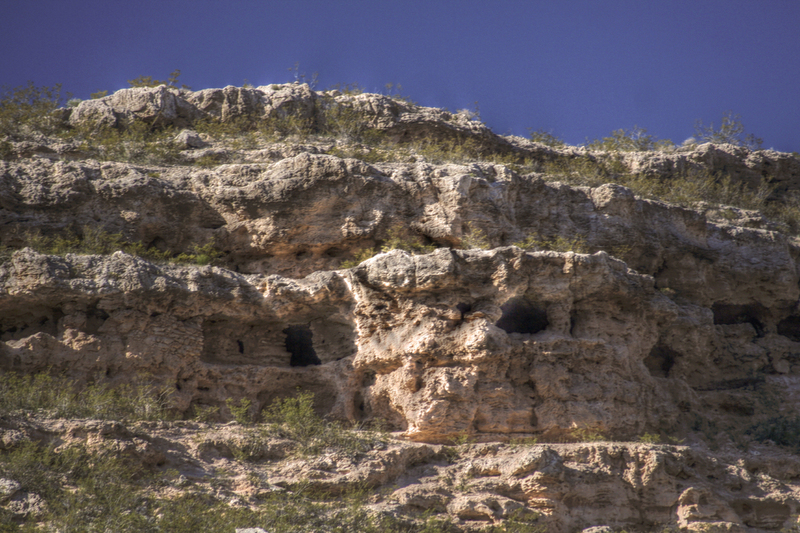 Recall the historical tie above associating Yavapai shelters and occasional storage to these natural caves as well as General Crook's confinement of the Yavapai to this reservation from 1872 to 1875. The trail will be obvious following a small drainage. Look to the cliff band to the north. 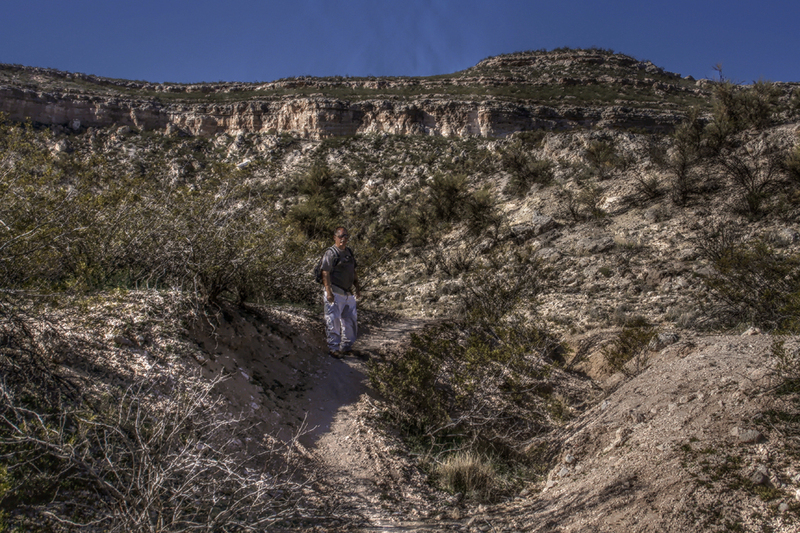 Just below the mesa high point, you should begin to make out a series of caves within the largest cliff band. You may be able to faintly determine the outlines of walls, windows, and doorways. After covering about 0.1 miles, the trail will fork. We decided to bear right towards the east on what appeared to be a gentler ascent. Not to worry, both trails converge at a flat bench after trekking about 0.25 miles. A forest of bizarre looking cedars lines the trail along the bench. You will soon come to another fork in the trail. Again we choose to keep right on a path the seems to direct us straight towards some caves with masonry walls blending into the cliff band. The trail becomes progressively steeper with loose gravel and scree in some spots making sure footing a challenge. At about 0.5 miles you'll pop up onto a terraced ledge. 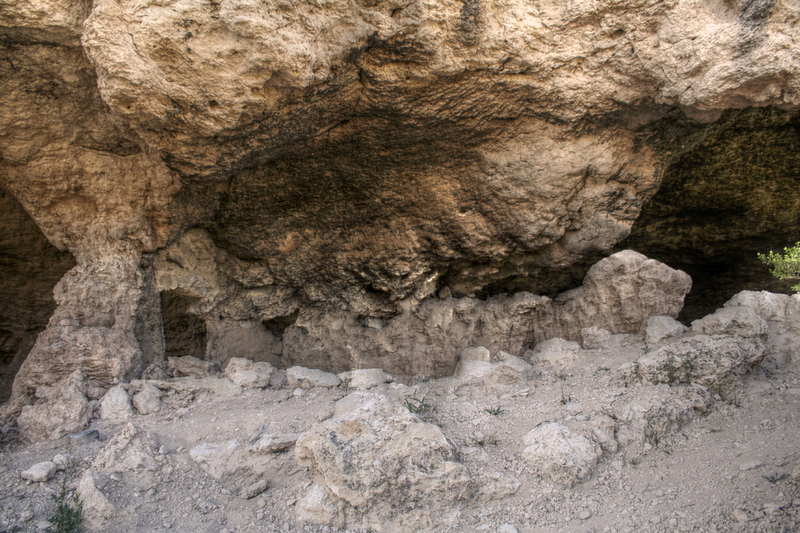 You'll find a series of caves with evidence of cliff dwelling residences and granaries. Corn cob remnants suggest more recent use (maybe by the Yavapai?). 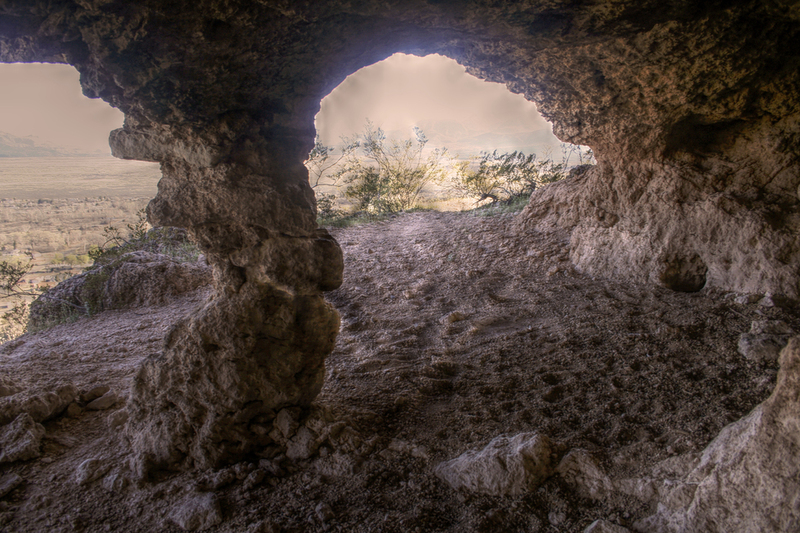 Explore the multiple caves along the terrace. Of particular interest will be a section of collapsed cliff face that appears to have obliterated some of the ruins. You can contour along the crack to the west where the cliff face has collapsed providing a route to the upper mesa. Researching this hike description, I found a reference to these cliff dwellings as "Clear Creak Ruins", or in Hopi language "Sakwavayu". 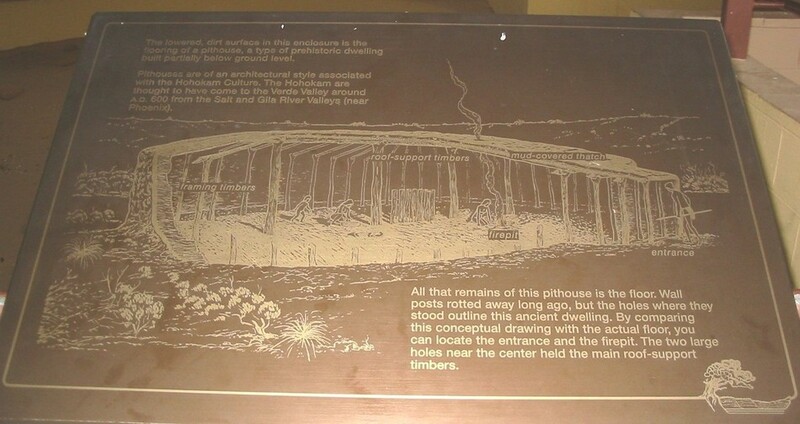 This reference suggests that at least 50 rooms and 1 kiva were constructed into the cliff face plus 2 pueblo ruins on top of the mesa. We circled the top of the mesa and couldn't find any evidence of an archeological site. We located the collapsed cliff face crack, and lowered ourselves down to the terraced cliff face. 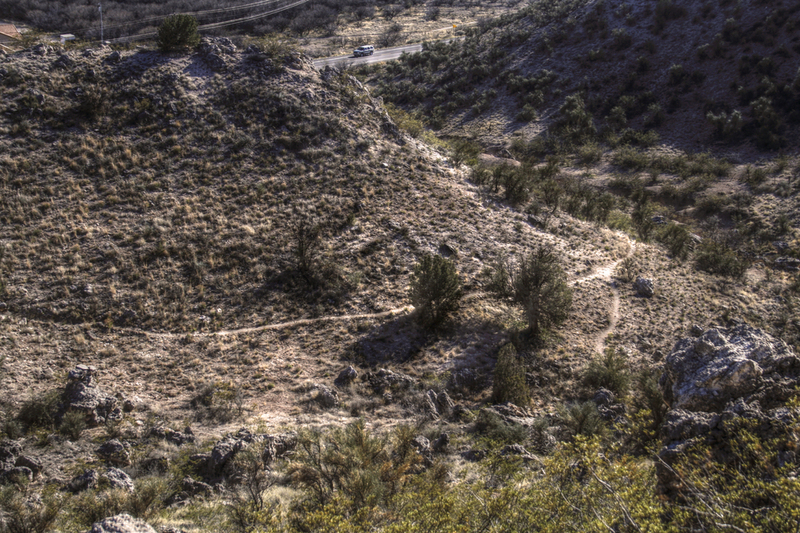 From the cliff dwellings and caves, we quickly retraced our path back to the trailhead. Each of these sites is a relatively short hiking distance, making it a kid-friendly choice. Enjoy! From Phoenix, take I-17 north towards Flagstaff. Travel about 75 miles to exit#287 for Hwy 260 located just before crossing the Verde River. Travel east on Hwy 260 about 7 miles until you see a mesa with cliff bands and caves appear on the north side. As Hwy 260 enters the midpoint of a gentle "S" bend onto Wingfield Mesa, you will notice Trail Head parking on the north side for about 3 vehicles. 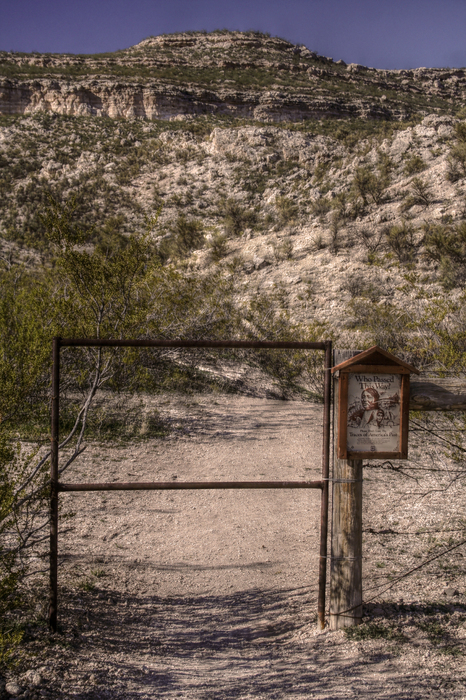 If you see E. Verde Lakes Drive, you've passed the trail head! GPS coordinates for the Trail Head are 34o 31.704'N, 111o 47.812'W. My GPS noted 105 miles traveled from my Ahwatukee home to the trail head. Travel time was just under 2 hours.